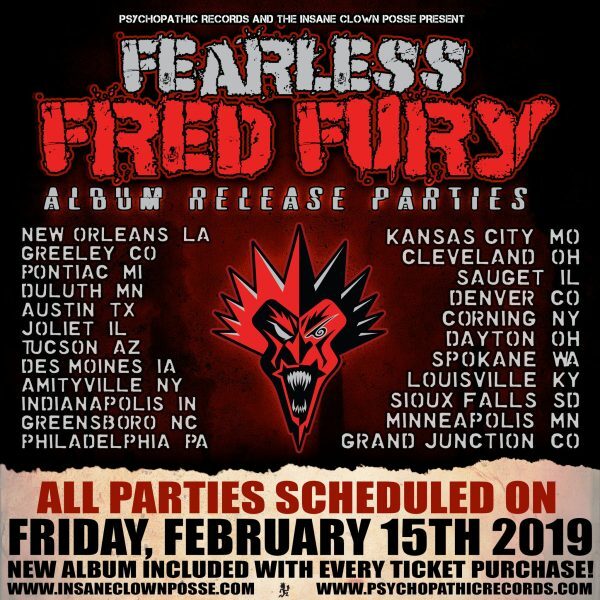 Fearless Fred Fury Album Release Parties Announced! Not long ago, Psychopathic surprised us by announcing another unexpected event! This one is a multi-city Album Release Party for Fearless Fred Fury! All you need to know is that there are 20+ parties planned throughout the nation, and ALL on Friday, February 15th! Will it hit a city near you? First, check the post below. BEWARE! FFF is coming… TO A CITY NEAR YOU! Fearless Fred Fury will be arriving 02-15 and Release Parties will be happening all across the country! Expect various Psychopathic artists, homies, and underground legends at EVERY SHOW! Who will be where? You will find out soon! All paid admissions will receive a copy of the new Joker’s card: Fearless Fred Fury! Look for details and ticket links soon!